James’ birthday is at the beginning of September, and we got him a scuttlebug and a balance bike. 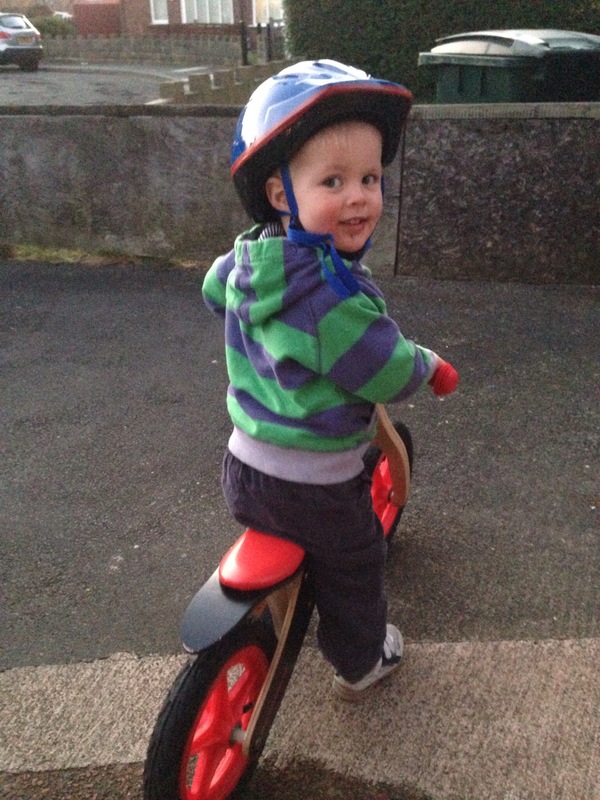 His balance bike was a little bit too big for him, and the scuttlebug a little bit too small. Since September we have tried him out on the balance bike several times. Each time he’s been very worried and cried to get off. So when he asked for his bike the other day when we were getting ready to go to the park, I eagerly rushed to get it for him. Except that wasn’t what he wanted. He wanted to walk. Except he didn’t want to walk, he wanted to scuttlebug. Except he didn’t want to scuttlebug, he wanted his bike, but not that bike, a different bike. So we ended up going to the park with James in the pushchair. However I’ve left the bike in the hallway and every time we get home from somewhere he has asked to ride his bike. He’s been so upset over this bike, worried, scared and we thought he’d never want to go on it. So being child-led in this one is working. He looks excited to be on his balance bike. I wish we would have used a balance bike. My son is 8 and still will not ride a bike, even with training wheels. A delightful tale and clever parenting! They do all pick up courage in their own time, I wonder if he will be a cautious chap when he grows up? Lovely to see him out on his bike, it sounds like quite a journey. Thank you for sharing on Country Kids.